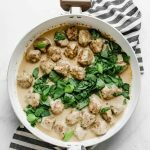 Savory Low Carb Turkey Swedish Meatballs in a creamy, delicious sauce that are perfect for an easy weeknight dinner or freezer meal! When Cody and I had our baby, one of our favorite meals that people brought us were meatballs. They’re easy to freeze, they can be paired with a ton of different sides, they’re delicious, and they taste like all things comfort food! 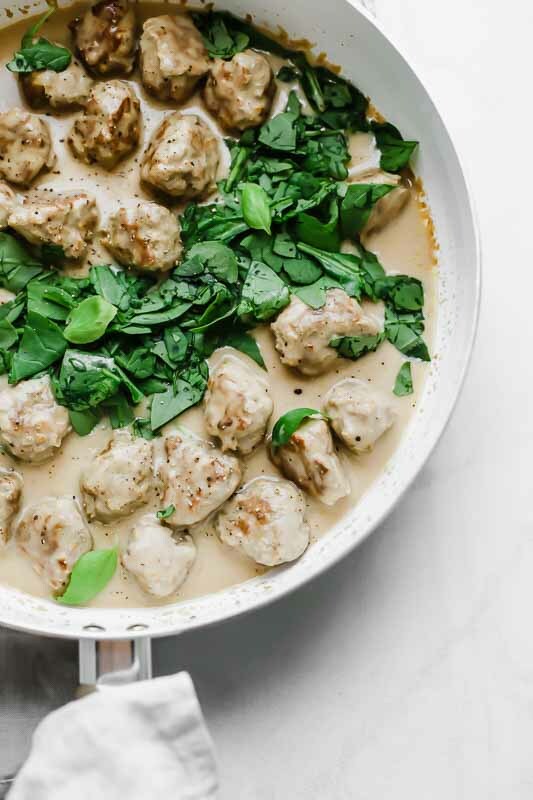 Today, I’m sharing my favorite Low Carb Turkey Swedish Meatballs with you guys and just know you’ll love it 😉 Whether you’re making these for you and your family tonight for dinner, freezing them for later, or taking them to a friend, this recipe is one of the best! Typically, Swedish meatballs are made with ground beef (like these Lebanese BBQ Meatballs). 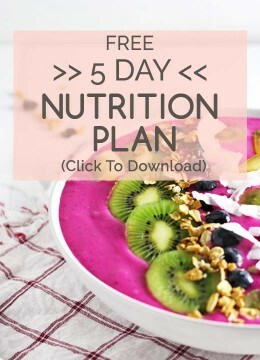 However, today we’re making this recipe with ground turkey for a lower calorie alternative! Mix all of the ingredients together for the meatballs. Cook or bake for about 20 minutes! Meatballs already tend to be low-carb, but I also used a low-carb bread in the recipe and almond flour instead of regular flour! Whisk together butter, beef broth, milk, and flour in a saucepan over medium-high heat. Bring to a simmer and let reduce/thicken before adding in the meatballs! 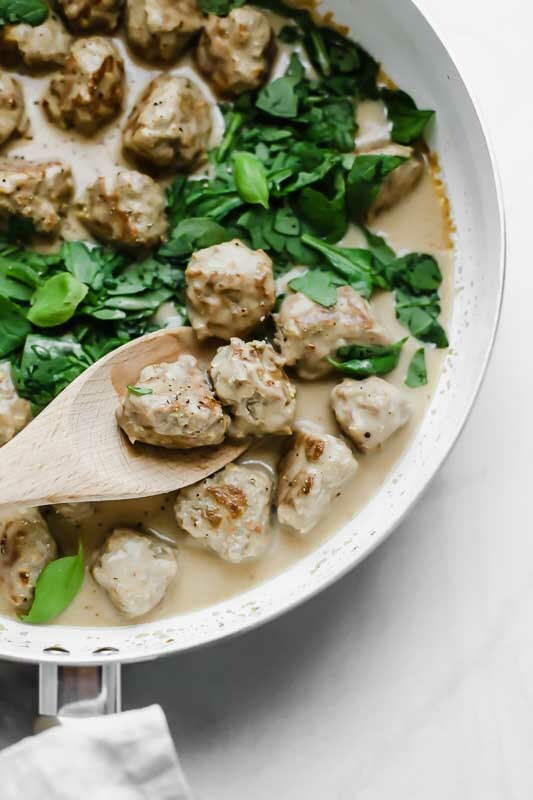 What is traditionally served with Swedish meatballs? 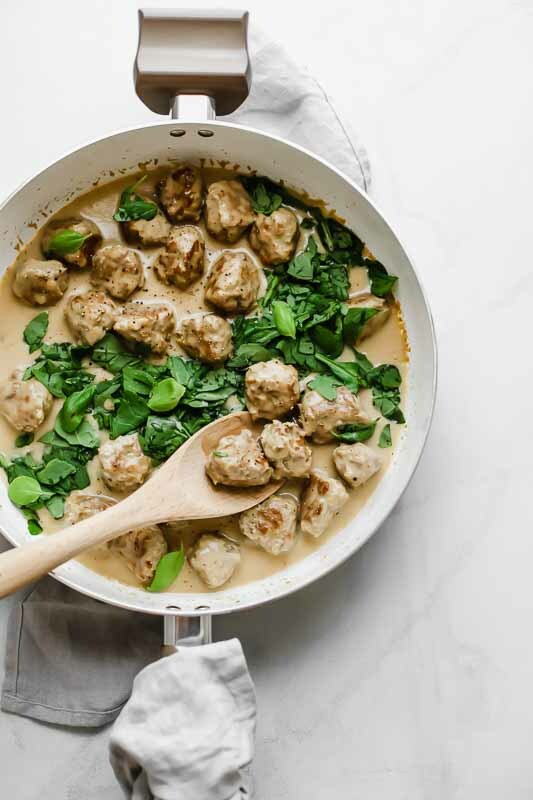 Swedish meatballs are traditionally served with boiled or mashed potatoes. However, they also go great with rice or noodles! For a lower carb option, try serving them over cauliflower or broccoli rice. Another option is to top them over zucchini noodles! Use a good freezer container, like these Rubbermaid BRILLIANCE Food Storage Containers! Not only are they freezer safe, but also microwave safe, dishwasher safe, 100% leakproof, airtight, and stack on top of each other perfectly. I used the large size for this recipe, but you can check out the entire collection HERE! To freeze, remove the containers from the refrigerator after about 1 hour and place in the freezer. 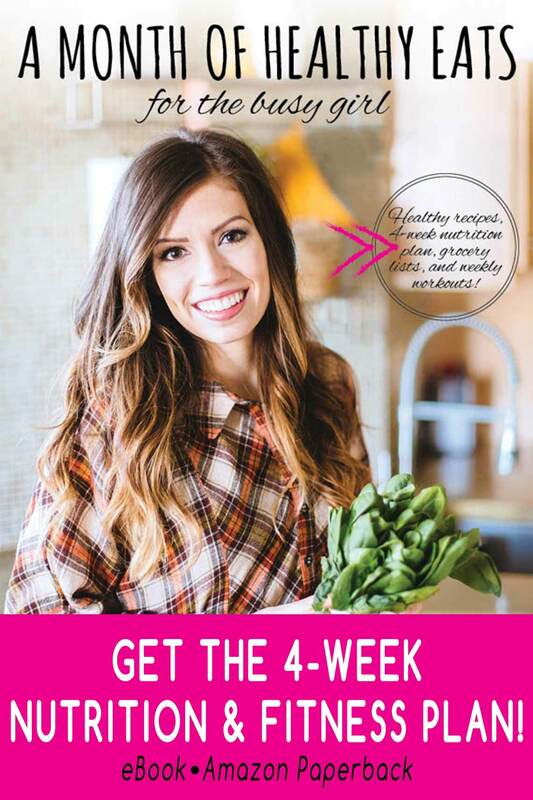 Be sure to check out the other freezer meals in this series! Lightly toast the bread and break into small pieces. In a medium sized mixing bowl, mash the chickpeas. Add in the toasted bread, ground turkey, egg, and spices. Mix together and roll into meatballs. In a saucepan, add the olive oil and cook the meatballs over medium-low heat (covered) until fully cooked, rotating every 3-5 minutes. Place the butter in the saucepan and heat over medium-high heat. Whisk in the milk and broth, bringing to a simmer. Add in the flour, continue to simmer for about 5 minutes. Remove from heat and allow the sauce to thicken. Add in the meatballs, coating each one with the sauce. what could i use instead of chickpeas? Feel free to use beans instead! Another option would be to use bread crumbs. 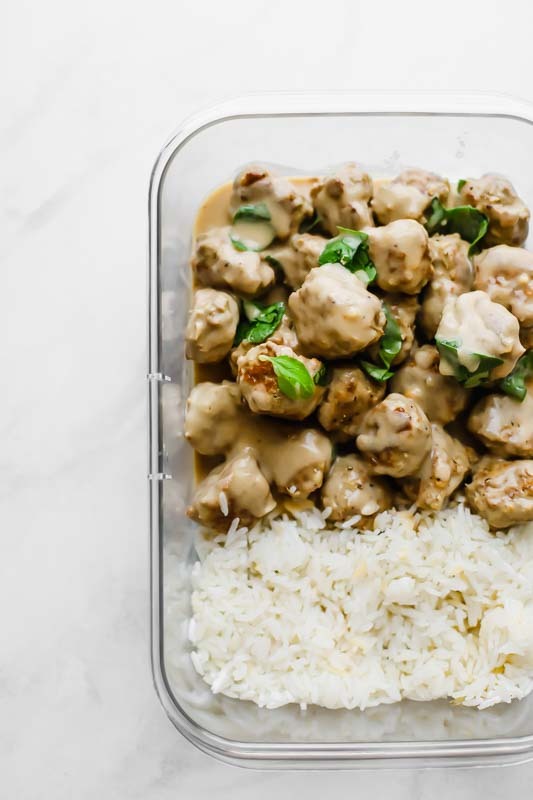 Is that basil in the meatballs? Hi, Bailey! I actually added a little spinach to my meal. Basil would also be delicious! I always love meatballs – it’s like you said, pure comfort food. I made these meatballs and they were delicious. I’ve never made turkey meatballs before so I thought it was time to try them. They worked out great. My kids always love meatballs so I knew they’d be a success for all of us. I put them with zoodles (another sure success) for a healthy dinner. I’ll be making this recipe again! Me too, so good! I’m so glad you enjoyed the recipe. Such a great idea to pair them with zoodles! So yummy!